The Gates Foundation’s move to cut family leave for employees sparked negative press last month, illustrating the frustrating gap between the support systems modern families need to thrive and what our country’s workplaces (and other spaces) are willing to offer. However, there are bright spots. For instance, real progress is being made in the movement toward lactation-friendly offices and public buildings. Just this year, there are new lactation rooms added or planned for state houses from Kansas to Colorado. In New York, employers with more than four employees must provide a lactation room upon request, starting March 18th. 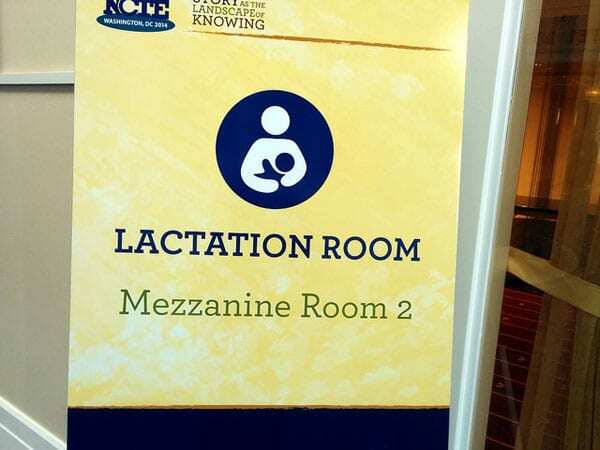 So, if you haven’t thought about lactation rooms when it comes to your organization’s office or events, it’s time to start. As NPQ has noted, the US is one of the only countries in the world without a national paid leave policy. The less time new parents have at home, the more they need access to a space during working hours (where, unfortunately, we haven’t seen employers embrace on-site daycares that could lessen the need for pumping breastmilk). Although the American Academy of Pediatrics recommends exclusively breastfeeding infants for six months, break time for nursing mothers at work wasn’t legally required until the Affordable Care Act (ACA) was signed into law in 2010. According to the federal Centers for Disease Control and Prevention (CDC), four out of five infants born in the US are breastfed from birth, while nearly 58 percent are still breastfed at six months and only 36 percent at 12 months. The benefits for mothers, children, and society as a whole, are well documented. Although women shouldn’t feel compelled to breastfeed, they should be supported if they choose to do so. And in some cases, a woman who can’t breastfeed might choose to pump exclusively instead to offer the nutritional benefits of breast milk to her child. Thankfully, the ACA has forced the majority of health care plans to cover the cost of breast pumps—dual electric pumps can range from about $75 to several hundred dollars—for parents and provide support and counseling for what can be a frustrating experience. But parents who pump need a dedicated space to do so in private. While the ACA also mandated that employers must offer “a place other than a bathroom, that is shielded from view and free from intrusion from coworkers and the public,” the regulations only apply to employers covered under the Fair Labor and Standards Act (FLSA)—and exclude employees who are “exempt” under FLSA. That means employers with fewer than 50 employees could claim that compliance causes an undue hardship, and it’s often on those doing the lactating to step up and ask for this accommodation. Some states, like New York, have stepped up to pass laws to ensure smaller employers are also supporting new parents. Although a lactation space doesn’t have to be permanent, for many small nonprofits, extra square footage can be scarce. One solution is to motivate employers with funding. In New Hampshire, a partnership between a local college’s public health facility and the state department of health and human services uses funds from the CDC to support $5,000 grants for organizations or businesses to create lactation rooms. The nonprofit New Hampshire Breastfeeding Task Force outlines how supporting breastfeeding employees is good for business and gives awards for family-friendly employers. Employers can also rent a lactation pod to support their working parents or clients, or for a large conference or event in a space without a lactation room. Breastfeeding discrimination’s economic impact is made worse by the fact that it reinforces other forms of discrimination that keep women earning less than men. Bias against mothers is one of the primary drivers of the gender wage gap. Mothers are judged to be less competent, they’re less likely to be hired or promoted, and they’re paid less. And expressing breast milk draws attention—via noisy pumps, bags of milk in the company fridge, and time away from work duties—to an employee’s motherhood role.